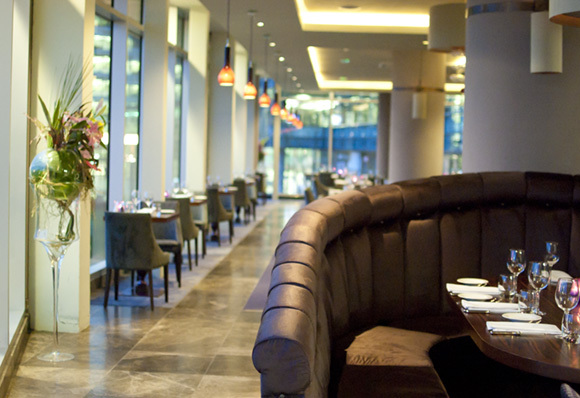 Bacon on the beech: Damson, Media City Manchester. 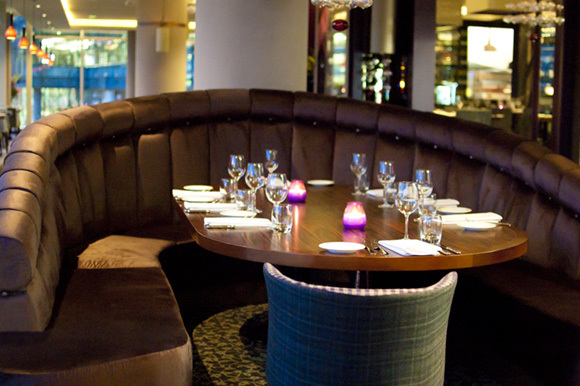 We've not been to the original Damson in Heaton Moor. But we've heard good things about it. So when I heard that they were opening a new place in Media City, I decided to book us in. I got them to email us a menu. There is some interesting stuff on there, but we were supposed to be on cheap eats, and this was slightly pricier than I had anticipated. I kept the booking anyway. I picked Mrs Bacon up from work on the Friday night and we drove from town to Salford Quays. Luckily we knew it was above Italian chain Prezzo, or we'd have easily missed it, they've not even had time to put the sign up yet. We walked up the stairs and into the impressive space. It was beautiful, with fantastic views out of the floor to ceiling windows. As it was the time when my mum and dad have their tea (strictly 5 o'clock,) there was nobody else around except the staff. I really enjoyed walking around the place, everything new and fresh, taking photos at my leisure. Mrs Bacon was watching TV out of the windows on the big screen. It was a bit weird though when 80's indie disco classic The Cult's "She Sells Sanctuary" was playing over the speakers - I've never heard this song been played in such an incongruously smart setting. They've really done a good job of the interior. I spotted an excellent looking large booth at the far end, we made a mental note - good for large groups and birthday celebrations. 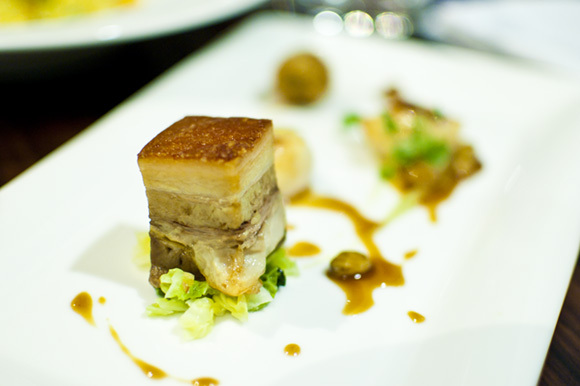 This was Mrs Bacon's favourite of the night. 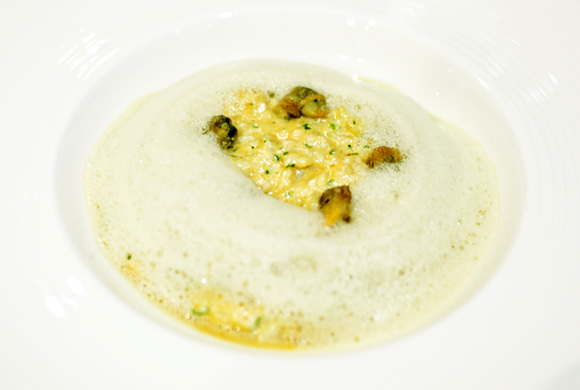 It was lovely and comforting - a perfect texture and the subtlety of the fresh crab was a real delight. It's funny with risotto, when I have a good one, I sort of don't think of it as rice (even though of course it is,) it's risotto and logged as such in my brain. 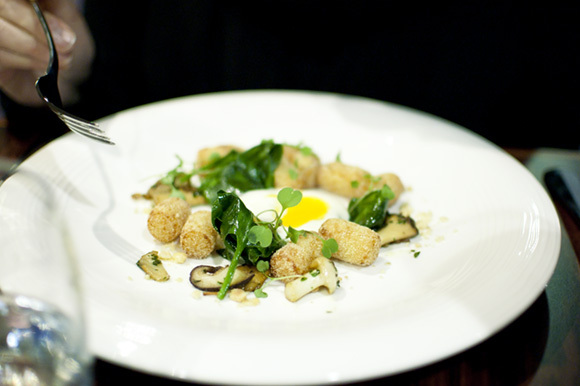 The Potato & parmesan gnocchi, sautéed wild mushrooms with parsley & garlic, slow cooked egg yolk, salted crushed hazelnuts, potato & truffle foam (£7.95) was also good, it looked pretty, again it was comforting and the flavours simply worked. Mrs Bacon desperately wanted to lick her plate clean. I got the feeling, not for the last time that evening that years of running a very popular local restaurant had put us in very safe hands. There would be no massive leaps in creativity, (although clearly there was some) neither would we want it, it was just great cooking, nothing to scare the horses; what they do, they do it brilliantly. 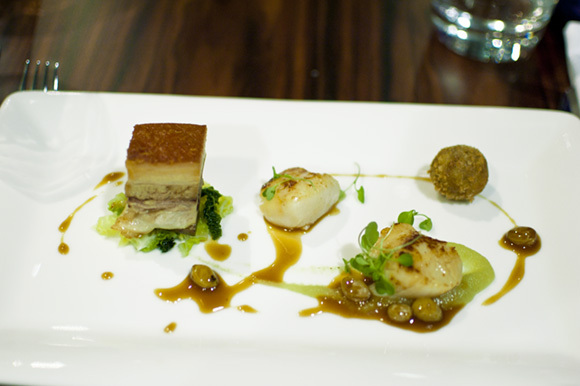 For mains we had a starter Grilled Scallops, slow cooked Middle White pork belly, Bury black pudding croquette, spiced apple purée & golden raisins (£10.95.) Another good combination. I was enjoying the crackling top when I realised I'd got carried away and hardly left any for Mrs Bacon and our allotted change over. She would not let me forget this in a hurry! 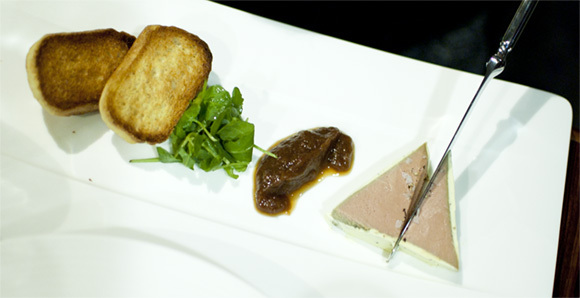 We also had the Chicken liver & foie gras parfait with rhubarb chutney & toasted potato bread (£8.95.) Whilst this was a pretty good paté, Mrs Bacon warned it wasn't quite quite foie enough for us, (see why here) but it was decent and rich. Chicken liver & foie gras parfait with rhubarb chutney & toasted potato bread. The Pièce de résistance for me was the Pumpkin Risotto with Blacksticks blue cheese, roasted chestnuts, salted pumpkin seeds & sage (£12.95.) It was just perfect. 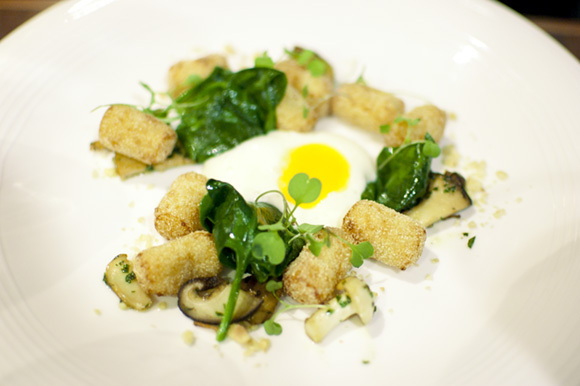 A really lovely dish, I like intense flavours, so the strong blue cheese was a real winner for me. 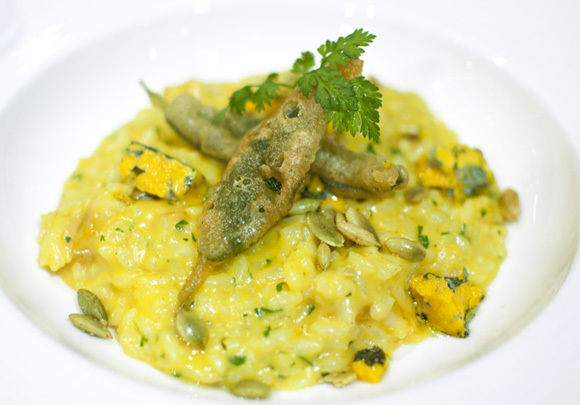 Pumpkin Risotto with Blacksticks blue cheese, roasted chestnuts, salted pumpkin seeds & sage. 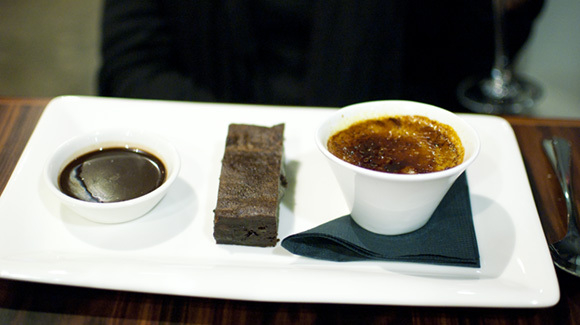 Of the desserts, Pistachio Crème brulee, prune, chocolate & prune brownie, hot chocolate fudge sauce (£6.95) was our favourite. The brownie was a real treat. Proper moist as we like to say. Pistachio Crème brulee, prune, chocolate & prune brownie, hot chocolate fudge sauce. 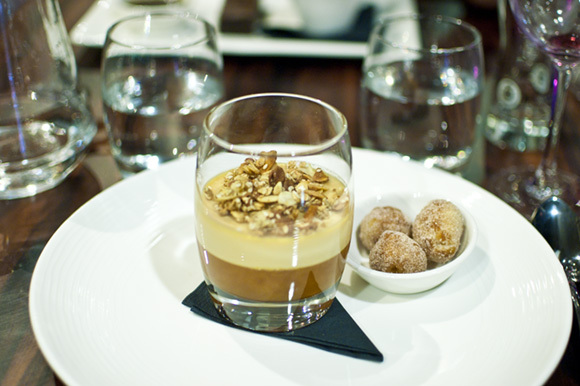 Although it looked the part, neither of us were quite as into the Butterscotch panna cotta, caramel, orange & ginger jelly, granola & hot cinnamon doughnuts with orange curd centre (£6.95) We loved the little tiny doughnuts, but I wished the panna cotta had been just a plain one. 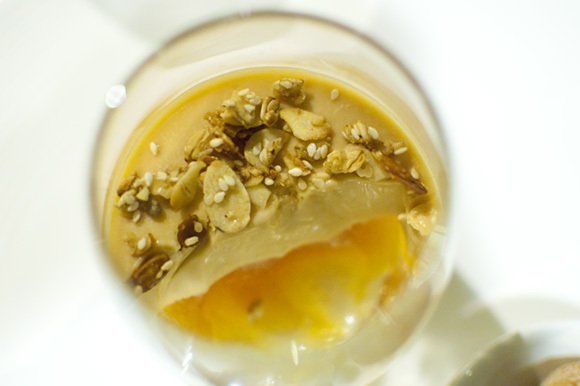 Butterscotch panna cotta, caramel, orange & ginger jelly, granola. Our bill came to £72.68 which because we'd done the starter mains/switch we thought was good value. Like I said, Damson does what it does brilliantly, it's clearly a very well run operation. 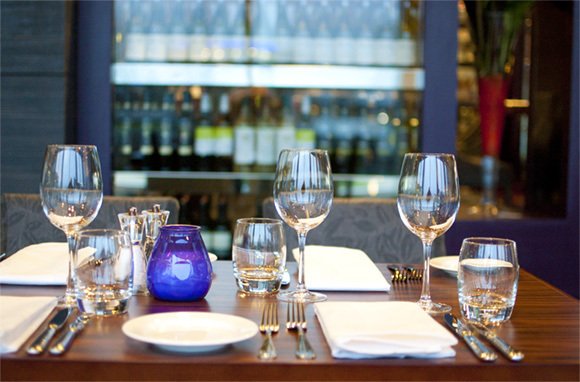 When you eat out as much as we like to, you end up comparing restaurants. 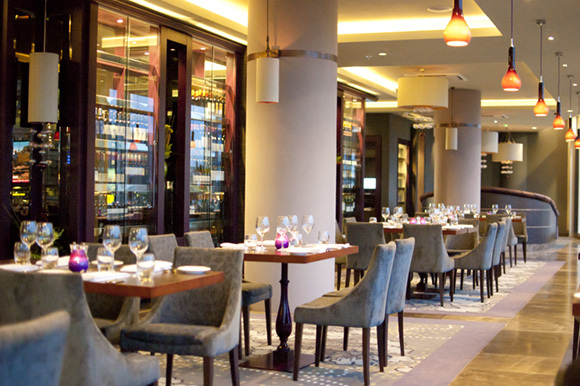 I would class this as at the upper end of what I like to think of as a (very good) middle range restaurant. The food at our local favourite Etrop Grange is on a different level in terms of creativity, it's higher end, more cutting edge and possibly more challenging to some (not us though.) I suppose the food here is fairly ambitious for Manchester though, (with the foam elements) but most importantly it all tasted great. When you go to somewhere like Damson you want solid dependability great food, in a beautiful setting, and that it exactly what you get. Pretty much everything was done perfectly, and you can't say fairer than that. Price: About £72.68. 2 glasses of wine & 5 courses. 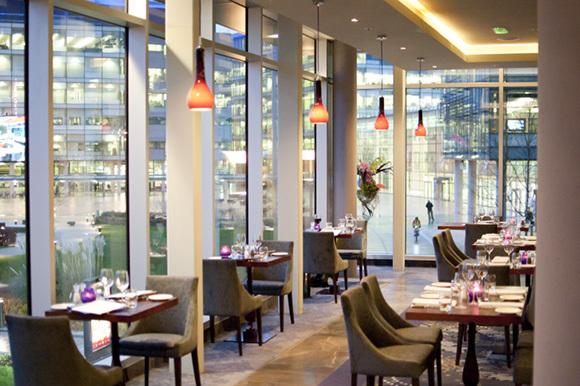 Atmosphere: Beautiful interior, good & interesting views over the BBC & Media city. Mr Bacon: Pumpkin risotto with Blacksticks blue cheese. Mrs Bacon: Whitby crab & parsley risotto, salt & vinegar cockles. *Minor point; currently you do not get your car park for free, it cost us £4.50. I believe the restaurant are working on this.